Only halfway into the summer of 2003, and the most dreadful studio blockbuster of the year finally reaches the multiplexes. 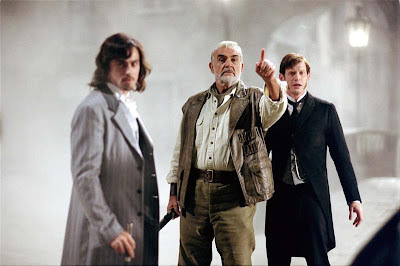 "The League of Extraordinary Gentlemen" tramples across the screen like a stampede of destructive elephants, wrecking everything in its ferocious path without necessarily intending to do so in the process. And that's a sad prospect, because when the movie opens, the intriguing premise suggests that there is, indeed, a valuable product hidden beneath the coarse exteriors. But then without hesitation, the movie goes nuts and becomes this giant web of chaos, sometimes even at points when we least expect it to. In this league's "extraordinary" universe, there is no rule book, no presence of logic, and no factor of intelligence whatsoever; it exists merely on its own plane of stupidity, feeding off ineptitude at such an alarming pace that it's a wonder any kind of filmmaker could salvage a product worthy of a wide theatrical release. 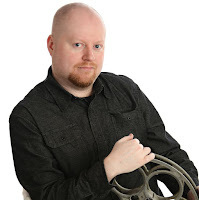 But then again, director Stephen Norrington isn't exactly your ordinary filmmaker, either. A quick browse through his profile at the Internet Movie Database reveals him to not only be the director of "Blade," a fantastic action film, but also a participator in the special effects of such popular endeavors as "Alien." Here is a man who indeed seems to be motivated by great ideas, driven by the potential to deliver something unique, provocative, engaging and clever without actually seeming too conventional in the process. With "League," the level of ideas are high and the creative possibilities even higher. What went wrong? Perhaps that's a question Mr. Norrington should be asking the writer; as much as he tries to make this travesty work, his ultimate fault is the script, which is a dumb and incoherent collection of halfhearted action scenes and anticlimactic payoffs that feels like it was pieced together from leftover frames from the graphic novel it was based on. In terms of source material, at least, someone had the right idea. "The League of Extraordinary Gentlemen" may be a lot of things, but one thing it isn't is unoriginal. Get this: the main character, an adventure-seeker named Allan Quatermain (played in the movie by Sean Connery), is summoned by the British empire to partake in a quest to uncover and destroy the secrets of a mysterious villain dubbed "the phantom," who plans on blowing things up to start a world war (go figure). The hook: his teammates in this mission are to be some of the most famous in late 18th-century stories: Captain Nemo (Naseeruddin Shah),an experienced traveler whose journeys are done via an intricate sea vessel known as the Nautilus; Dorian Gray (Stuart Townsend), an immortal man who must never look onto his own portrait if he expects to continue to live; Rodney Skinner (Tony Curran), the translucent acrobat better known to us as the "Invisible Man"; Dr. Henry Jekyll (Jason Flemyng), the man behind a revolutionary formula that can bring out a ferocious alter ego; Mina Harker (Peta Wilson), the late wife of Jonathan Harker and long-lost love of Count Dracula; and Tom Sawyer (Shane West), a young American adventurer who jumps at the chance to be involved in any sort of situation that requires adrenaline. Together, these seven individuals form the powerful League of Extraordinary Gentlemen, and understandably so; unlike any of the other heroes of that era, these people posses abilities that aren't just unique or distinctive, but also unmatched by even the most gifted counterparts of their era. They are the X-Men of their generation. Sadly, even with a platform as sturdy and promising as this, "The League of Extraordinary Gentlemen" takes an immediate nosedive into the world of the unintentionally-bad summer action vehicle. It begins quite innocently, as our hero Mr. Quatermain is poked and prodded by a British representative into participating in the worldwide search for the Phantom, and then begins to exhibit signs of weakness during a bar shoot-out in which bullets pierce victims without killing them. "They're indestructible! ", one man shouts. "Nah, they're just armored," Quatermain responds. Gee, thanks for telling us, Sherlock. But wait, it gets even more pathetic. After the troupe of teammates finally gather and decide to undertake their search for this Phantom character, they hop aboard the Nautilus and track the villain down in Venice. Now never mind the fact that this giant-sized ship is able to navigate those tiny canals of the city without ever scraping the bottom or destroying the bridges above it. Never mind that a motor vehicle in the 18th century is able to plow its way through wide streets that don't actually exist. And never mind that there is a graveyard in a city that is infamous for its burials at sea. These are actually all minor points to an even bigger load of bull: a plot that involves blowing up the entire city with thousands of little bombs that have been strategically placed in the canals beneath it. If this task goes through, as the Phantom intends it to, will he get his world war? Will the League be able to stop him? Will anyone in the audience with half a brain even care? If misconceived ideas aren't enough to destroy the potential impact of the movie's premise, the dialogue certainly is. During its 112-minute running time, "The League of Extraordinary Gentlemen" manages to have its characters spout out some of the worst lines in the history of the movies, lines that go beyond being just unfunny and come across as completely transparent attempts to add wit to the already-witless product. There is a moment, for instance, when Alan reacts to hearing the Phantom's name by actually saying, "how operatic." Someone get this guy a nighttime talk show. The movie's actions scenes are amateurish to the point that even the involved actors seem frustrated by the material, and the ending is so inexplicably horrid that I felt like crying in disbelief after it was all over. When it comes to being a misfire, "The League of Extraordinary Gentlemen" doesn't just represent the most joyless and clueless of the summer blockbusters, either; it also serves as a startling reality check to those who assume any great idea will translate into a great screen result as well. This is the kind of movie that actors refer to when they talk about their worst career choices.